Everyone has their favorite source of getting information – some monitor your tweets, others check your facebook page, yet others prefer to have all info delivered straight into their inbox. Emails seems to be preferred by slightly more conservative people, those that are unwilling to get distracted by social media. 2. It’s great content for your social media channels! 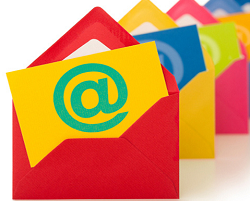 Sending email newsletters doesn’t mean you’ll be missing out on everyone else! You can still (and better do) tweet and share your newsletter on social media. Most newsletter tools generate you a link to share a web version of your newsletter – either use that one, or, publish your newsletters in a special Newsletter Archive section on your site and share the website link. Even though lots of people get their info from social media, a vast majority is still getting their information from search engines. Maintaining a newsletter archive section on your site, you are regularly plugging in huge keyword-rich content in your site. And this, as we know, is vital for the search engine optimization of your site. At the same time, maintaining a Newsletter Archive is a matter of copy/pasting the newsletter HTML on a website page and maybe quick fixes of formatting and links. So – go for it! In IndigoVerge newsletters we usually include new case studies, a digest of our recent blog posts, popular posts on Twitter/Facebook, digest of important industry-related news and calendar of free industry webinar/offline events. In other words, in addition to summarizing the novelties around our company and projects, we keep our readers informed about the key news and events in the industry as a whole. We are anyway following this info, why not share with our current/potential customers too and help them stay informed. Newsletters are a great way to keep reminding your potential customers about your project/company. They may not be needing your services at the moment you contact them, but if they subscribe to your newsletters – you can ping them just when they are actively looking for those services. Meanwhile, you’ll be building trust and establishing yourself as a reliable partner by keeping them updated with your client success stories and news, on a regular basis. If you count on advertising as a source of income, you may offer sponsored posts or announcements in your newsletter. You may include attractive images or highlight the post to drive the attention. Just make sure to include relevant sponsored content and keep it balanced/about the same size as regular newsletter sections. Finally, using a newsletter tool it’s so easy to create your newsletters! You usually have a one-time initial effort to design your mail template, from then on it’s only plugging in the new content. For each newsletter you have clear stats on views and clicks, so you can very well figure out which content gets most appreciated. To wrap up, if you really include valuable content in your newsletters, content that is useful and concisely written, you will certainly get great response from your readers. So, make sure you plan your newsletter content well, schedule it regularly and newsletters are bound to become an efficient tool in your online marketing strategy.